The firing of Phil Lord and Christopher Miller from the Han Solo movie feels like it could be a turning point for the rejuvenated Star Wars. We’re learning a lot more about what Lucasfillm feels is acceptable within its universe and what isn’t. The problem is that what’s acceptable looks to be very, very narrow. Disney bought Lucasfilm in 2012, beginning work on new Star Wars movies almost immediately. Disney also started streamlining pretty much all production of material within its universe, canceling Clone Wars, shutting down the production arm of LucasArts, moving the comics license from Dark Horse to Marvel (another recent Disney acquisition), and decanonizing pretty much everything that had been made prior to 2012, with the obvious exceptions of the movies themselves. Some of those were business choices that clearly make Disney more money. Some of them—the canceling of Clone Wars and the end of the EU—seemed to be part of a larger movement towards having more control over the products being made under the Star Wars name. It was fairly obvious, for example, that developing sequel films that took into account the decades of books set in that period was going to be a lot of work. It was much easier to wipe the slate clean, and gave future projects much more flexibility as well. Even fans of the EU would have to admit to the fact that the sheer number of stories that had been set post-Return of the Jedi would have made writing an Episode VII difficult. To continue the movies, everything else had to go. J.J. Abrams was perhaps a director uniquely suited to the task. He’d stated his love for the franchise over and over. Super 8 showed an ability to successfully mimic the style of another director. Plus, the saga films are all meant to fit together, so it didn’t seem too much of an imposition for The Force Awakens to be so wedded to what we’d seen before. Disney’s plan, as we know it, is to release a Star Wars movie every single year until it stops being profitable to do so. 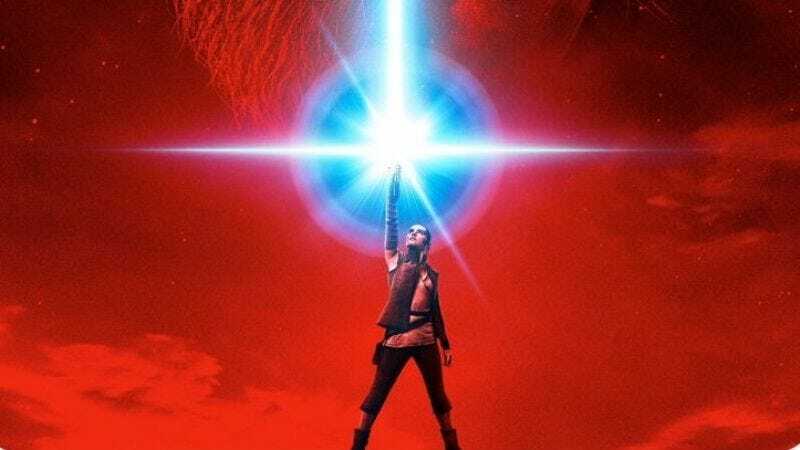 The “saga” films will be “episodes” continuing the main Skywalker family story, and they’ll alternate release dates with “anthology” films, which will be standalone stories set all over the Star Wars universe. These anthology films seemed like they would be ideal places to experiment with Star Wars and keep it from getting stale. One of the things that so ignited the imagination of fans was the world-building of Star Wars, which created a universe that could support all sorts of stories. Tragedies, comedies. Stories about saving the universe and more personal, private ones. The fact that all of those things easily fit in the universe makes it feel real. The anthology films should have been a place to take advantage of that. But instead of the full rainbow, we’re just getting many shades of green. Lucasfilm and Disney seem to be so wedded to quality control that they’ve become totally risk-averse. So the subjects of the anthology films are things everyone already knows about, while the “episode” movies themselves aren’t allowed to deviate too far from the standard action-adventure tone of the original Star Wars. That sense of being quality-controlled started to be evident with Rogue One. It was a direct prequel to A New Hope, filled with cameos of characters fans would recognize. It’s an idea that makes some sense; it’s perfect to ease people into caring about new characters by making the plot of the movie integral to the mythology. The darker tone also eased people into the idea of different-feeling Star Wars. But Rogue One’s production wasn’t smooth and the need for Lucasfilm to rein it in so it would be in line with the company’s vision was evident, from its famous reshoots to giving more power to writer Tony Gilroy on the set. The company’s desire for control to make sure no film strays too far from the mean is even clearer with everything we’re hearing about the Han Solo film. Han Solo was a weird choice for an anthology film. He’s an iconic character, so it’s a safe bet as far as name recognition. But Harrison Ford’s portrayal is likewise so famous that there’s a huge risk if the casting isn’t perfect. Lord and Miller were another interesting fit. Their background is clearly in comedy, so it seemed that where Rogue One shaded darker, this movie was planned to go the other direction. And yet, all of the reports note that friction developed from the things you’d 100 percent anticipate in hiring comedic directors. Their style is bound to be semi-improvisational; you can tell that from literally every other thing they’ve ever done. That’s reportedly what caused the rift. Remember how everyone went nuts for Captain America: Winter Soldier and Guardians of the Galaxy? Part of the reason those films stood out was because they were so different from anything else we’d seen in the Marvel universe. By all appearances, Lucasfilm doesn’t want that much variation. What it wants is more akin to a TV show, where the different directors brought in don’t make a huge stylistic difference to the whole. On the face of it, that’s not a bad thing. If you’re telling a story over many different installments, you obviously want them to flow together. It certainly makes a ton of sense for the saga films. Rian Johnson seems to be having no problem building on Abrams’ success for The Last Jedi. But when applied to the anthology films, it just makes things bland. So the question is, if Lucasfilm is determined to play it safe, why hire Lord and Miller in the first place? And it’s not just the movies where this rigid control has become obvious. The Star Wars novels are showing the same strain. For all its faults, the old EU was never lacking in creativity. There were a ton of authors, all with very different styles, exploring many different aspects of the universe. Even when the books were bad, there was an excitement to finding out what they’d reveal. In books, which don’t require a special effects budget, it makes even more sense than with the anthology films to cut loose, to let writers explore corners that are never going to make it to film. Weirdly, that’s not the case for the new canon. The books that have been released so far show a similar resistance to telling stories not welded onto the existing mythology. They’re either like Rogue One and prequels to the main movies, or, like the upcoming Han Solo film, focused on and named after familiar characters. They’re exploring events and characters that have already been established, and they don’t do those things in interesting ways. The old EU had a book called The Truce at Bakura, which takes place immediately after Return of the Jedi. But it’s not another Rebel/Imperial engagement—it’s a fight against a completely different enemy called the Ssi-Ruuk. Was it a brilliant work of fiction? No. But I remember it because it tried something new. The new Star Wars canon books are so beholden to the movies that they usually just repeat those stories, expanding the edges just enough to intrigue readers, but without revealing anything that might step on a movie’s toes. Is it because there’s always the chance that there will be a Side Story movie set on a specific Rim World no one has ever heard of starring brand new characters, so there can’t be any esoteric canon to deal with? Is it because they think people will only buy books if they’re basically extensions of the movies? It’s hard to tell. But either way, the result is a universe of possibilities being severely limited to the same damn places and characters over and over again. All the books feel like Lucasfilm and Disney handed an outline and checklist to the author and told them to follow it. They’re welded together in really obvious ways, not organically unfolding a story. Everything set before the original trilogy has some tie to the Death Star, making it increasingly insane that it was somehow a secret, since it apparently affected every single person’s life. There are also constant, clumsy references to something out in Wild Space, something the Emperor is obsessed with. You can tell it’s on the list issued by Lucasfilm and Disney and if it isn’t related to the First Order and Snoke, it will simultaneously be a twist and deeply annoying. It’s telling that the most anticipated book was Timothy Zahn’s Thrawn, importing a character from the EU into the new canon. Thrawn’s popularity as a character partially comes from him being such a unique creation. A lot of what Zahn did was bring a number of things from the old EU to the new canon in a way that reminded me just how diverse the stories used to be. Like Abrams, Zahn knows this universe well enough to incorporate the dictates of Disney and Lucasfilm in a way that still feels exciting and fun, even if it’s not, strictly speaking, new. Zahn does a lot more new than Abrams, certainly, but he’s still fitting his character into a universe with a lot of new restrictions. And like Rogue One, it’s not that these books are bad. But their main appeal is the new light they cast on the movies they’re related to, and very rarely their standalone stories. The same can be said for much of Marvel’s comic output. Outside of the main Star Wars title or something like Doctor Aphra, which is the rare story based on an entirely new canonical creation, it’s mostly releasing individual miniseries based on characters we’re familiar with, all brushing on the edges of things that happened in the movies rather than trying to tell something that feels entirely new. The most variety we’re seeing is in Rebels, but even then it’s set before A New Hope and includes many appearances from well-known, established characters. The overall quality of the Star Wars universe is better now. Every installment—movie, book, TV show, comic, game—is, at worst, at the low end of mediocre. The old universe’s canon had some truly low lows that are gone now. But it also means that the highs aren’t as high, and the result is the Star Wars universe isn’t as much fun. Even the worst old EU book felt like it was trying to do something new. Star Wars feels smaller than it used to, which is a shame when there is literally an entire galaxy to explore. Maybe if Lucasfilm would give its directors, authors, and artists just a bit more leeway, it could see that Star Wars doesn’t have to always revolve around the original trilogy. There’s literally an entire galaxy to explore, and I for one would like to see it.